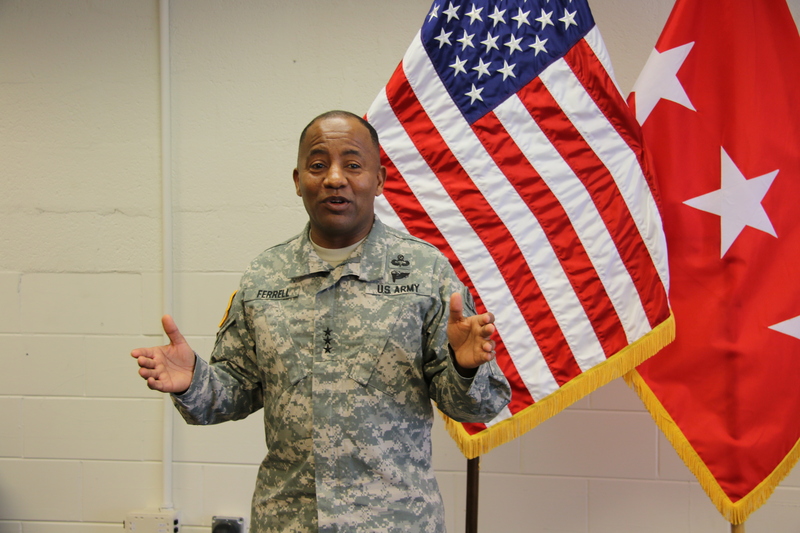 Lieutenant General Robert S. Ferrell, a proud native of Anniston, Alabama, was commissioned into the U.S. Army in 1983, shortly after completing his undergraduate education here at Hampton University. Though LTG Ferrell has been all around the world and interacted with many different people, he has never lost the values and knowledge that were carefully instilled in him at what will forever be his Home by the Sea. A: I’m very fortunate to come from a family with a long tradition of military and public service. My father is a former Army Signal Corps Soldier – and served in the Korean and Vietnam Wars. From the 8th grade I had a desire to follow my Dad’s footsteps and go into the Army. I also have an Uncle who served as an Infantryman in WWII and another who served in Korea. In addition, I have six brothers and sisters – two served in the Air Force, three in the Army and one served more than 30 years in the U.S. postal service. My oldest son has worked for a defense firm in the past and my youngest son is a third generation Signal Soldier and an NCO in the Army today. I even have nieces and nephews who currently serve in every branch of the Armed Forces. I guess you can say the military is like the ‘Ferrell’s family business!’ I’m deeply proud to have worn the Army uniform and have enjoyed every day as a Soldier. Q: What have been some of your biggest struggles as an African-American in the military? A: Of course – there are always struggles. What I prefer to focus on are the opportunities the Army has offered me during my 36 years of service. I’ve had the chance to serve alongside dedicated, committed, intelligent men and women with tremendous integrity and character. The key in the Army to taking advantage of opportunities – and to overcoming struggles – is mentorship. I’m lucky that I’ve been mentored by outstanding senior leaders and peers, and in turn, have had the chance to mentor others. As a Soldier, I’ve had the opportunity to serve in places like Germany, Bosnia, Iraq and all across the U.S. I’ve been honored to lead Soldiers at just about every level – from a platoon to a global command of more than 13,000 Soldiers, Army Civilians and contract personnel. At every turn, the Army trained me, developed me and challenged me. What’s most important is the Army offers these same kinds of opportunities for thousands of young men and women from every part of our diverse nation. Q: Do you think your HBCU education has helped you? A: Absolutely! I am an enthusiastic supporter of historically black colleges and universities. For me, a great HBCU like Hampton was the perfect college choice. Hampton not only gave me a first-rate education inside the classroom, it also gave me life lessons derived from being a part of the Hampton community and an ROTC Cadet. I know there have been many changes in education since I went to school, however I continue to believe that HBCU’s fill a critical role in providing opportunities for young people. We are an increasingly diverse nation and HBCU’s do a great job of reaching out to parts of our society that have been traditionally underserved at the college level. Q: What has been your favorite thing about serving in the military? A: I have always been given great opportunities in the Army. I was particularly proud to have the chance to serve as the Chief Information Officer and Director of C4 Systems for U.S. Africa Command. I traveled all across the African continent and visited dozens of nations – representing the U.S. and building relationships with our partners around the African region. It was a once in a lifetime opportunity to enhance the capacity and capability of nations we work closely with – and to improve relationships between nations and military forces on the continent. I was privileged to meet and to serve alongside so many great people there. Along with rewarding tours of duty like U.S. Africa Command, my favorite thing about the Army has been the Soldiers and Army Civilians I served alongside. What a great group of people – committed to something larger than themselves, motivated by public service and focused on getting a job done, no matter how difficult. Everyday I’ve been in uniform, someone around me has inspired me or motivated me by their positive attitude and commitment. Q: Are there any changes you would like to see in the military? A: One of our major goals across the armed forces is to encourage young people with an interest and aptitude in the STEM fields (Science, Technology, Engineering & Math) to consider serving with us – either in uniform, or as government civilians, or in the defense industry. So, one change I would definitely like to see is more young people with STEM backgrounds in our force. We have a critical need for Soldiers, Army Civilians and Defense industry professionals with STEM skills who can help us keep our technological edge. This is especially true in my current area – information technology and communications. However, STEM supports almost every part of our Army – from designing and engineering combat vehicles and aircraft, to developing unmanned, robotic systems and advanced medical technology. Wherever you look our military needs young people with STEM training. So – I would love for Hamptonians and others from great schools to look to our military for STEM career opportunities. Q: Who is someone that inspired you while in the Army? A: Well, for me, inspiration started right at home with Mom and Dad. As I said earlier, my Dad was a career Soldier and a great example. He not only encouraged my dream of becoming a Soldier – he has been there for me every day of my career. It’s much the same with my Mom too. Growing up my Mom was always my “rock”. She is the one who really grounded me and instilled me the values of hard work and always doing what’s right. She set the example of selfless service by always giving and doing for others, even at her own personal sacrifice. She never looks for credit or limelight; she just gives from the heart. As far as others who inspired me – there are just too many to name! Coming from Hampton – you’ve got to be inspired by the legacy of our founder, General Samuel Chapman Armstrong. He fought at Gettysburg and exemplifies our nation’s ‘Citizen-Soldier’ tradition of service. I was also inspired by great leaders like LTC Claude Vann – another Hampton legend and alumni. Every day of my career leaders like BG (Retired) Clara Adams-Ender, the late LTG (Retired) Robert Gray and the late LTG (Retired) Ed Honor – and great officers like General Johnnie Wilson and General Dennis Via, who today leads the U.S. Army Materiel Command – all inspired me by their example. These leaders either cleared a path that I was able to follow, or gave me an opportunity to work hard and succeed. One of my greatest inspirations is my wife, Monique Doute Ferrell. Monique is a senior Army Civilian leader and serves today as the Director of the Army’s Sexual Harassment/Assault Response & Prevention Program. She’s not only a tremendous public servant, she’s also a Hampton alumni. We met here as students and she’s been my most important inspiration ever since then! More political bs to continue feeding a dead horse, congratulations to this man, but it’s 2016. Think about what you see happening around you, it’s called change, some things are no longer needed. Im just saying.